PRELIMINARY INFORMATION: NO PURCHASE NECESSARY. A purchase will not improve your chances of winning. Void where prohibited. 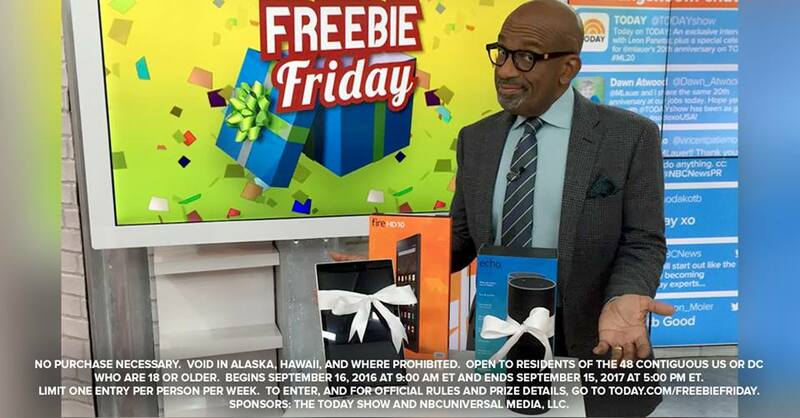 The Freebie Friday Sweepstakes (“Sweepstakes”) will begin on September 16, 2016 at 9:00 AM EST and end on September 15, 2017 at 5:00 PM EST (“Sweepstakes Period”). All times in the Sweepstakes refer to Eastern Time (“ET”). Odds of winning depend upon the number of eligible Entries (as defined below) received. Sweepstakes is subject to all applicable federal, state and local laws. TO ENTER: The Sweepstakes will consist of fifty-two (52) individual weekly drawings (each a “Weekly Drawing”). Each Weekly Drawing will consist of (i) an entry period (a “Weekly Entry Period”) that will begin at or around 9:00 AM ET each Friday during the Sweepstakes Period (each a “Weekly Entry Period Start Time”) and will end at 5:00 PM ET on the same Friday (each a “Weekly Entry Period End Time”) and (ii) a random Weekly Drawing conducted on each following Monday (“Weekly Drawing Date”) from among all eligible Entries (defined below) received during such Weekly Entry Period. Entries must be received before the end of the Weekly Entry Period to be eligible for the corresponding Weekly Drawing. On or about the Weekly Drawing Date, there will be one (1) prize drawing (“Prize Drawing”) conducted from among all eligible Entries received during the entire Sweepstakes Period. There will be a total of fifty-two (52) Winners (defined below) selected throughout the Sweepstakes Period. To enter the Sweepstakes, during each Weekly Entry Period visit the TODAY Show Facebook page located at Facebook.com/TodaysTake (“Website”), and click on the Sweepstakes link provided in the Facebook post posted each Friday during the Sweepstakes Period and then follow the provided instructions to complete and thereafter submit the entry form, which includes your name, address, telephone number, email address, and date of birth (the “Entry”). All Entries become the property of Sponsors and will not be acknowledged. You may enter once per Weekly Entry Period for a total of fifty-two (52) Entries during the entire Sweepstakes Period. Non-winning Entries will not roll over into subsequent Weekly Drawings. Multiple Entries received from any person beyond this limit will void all such additional Entries. Entries generated by a script, macro, or other automated means or by any means that subverts the entry process will be disqualified. Entries must be received before each Weekly Entry Period End Date to be eligible for the Sweepstakes. Sponsors’ computer shall be the official timekeeper for all matters related to this Sweepstakes. Entries that are incomplete, garbled, corrupted, or unintelligible for any reason, including, but not limited to, computer or network malfunction or congestion, are void and will not be accepted. In case of a dispute over the identity of an entrant, the authorized account holder of the email address used to enter will be deemed to be the entrant. “Authorized account holder” is defined as the person who is assigned to an email address by an Internet access provider, online service provider or other organization that is responsible for assigning email addresses for the domain associated with the submitted email address. Entry constitutes permission (except where prohibited by law) to use entrant’s name, city, state, likeness, image, and/or voice for purposes of advertising, promotion, and publicity in any and all media now or hereafter known, throughout the world in perpetuity, without additional compensation, notification, permission, or approval. WINNER SELECTION AND NOTIFICATION: On or about each Weekly Drawing Date, one (1) or more potential winners (“Winners”, each a “Winner”) will be selected in a random drawing by representatives of Sponsors from all eligible Entries received during the corresponding Weekly Entry Period. Sponsors will make two (2) attempts to notify potential Winner(s) at the phone number and/or email address submitted at the time of entry. Sponsors may share potential Winner’s name and contact information with Sweepstakes Entities and/or any prize provider, as applicable, if necessary. Potential Winner(s) may be required to execute and return an affidavit of eligibility, release of liability, and, except where prohibited, publicity release (collectively, “Sweepstakes Documents”) within two (2) days of such notification. Noncompliance within this time period will result in disqualification, and, at Sponsors’ sole discretion an alternate potential Winner(s) may be selected from the remaining eligible entries. If potential Winner(s) cannot be reached, if he/she is found to be ineligible, if he/she cannot or does not comply with these Official Rules, or if his/her prize or prize notification is returned as undeliverable, potential Winner(s) will be disqualified and time permitting, at Sponsor’s sole discretion, an alternate potential Winner(s) may be selected from the remaining eligible Entries. Limit one (1) Prize per family or household. PRIZE: There will be fifty-two (52) prizes awarded (each a “Prize”), one (1) Prize to each Winner. 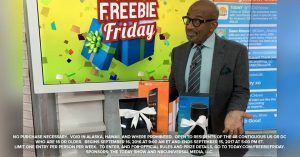 Each Prize will consist of the following: an item or product that is featured on the TODAY Show, to be selected by Sponsors in their sole discretion. Prize will be awarded “as is” with no warranty or guarantee, either express or implied by Sponsors. Prize is subject to certain terms and conditions as specified by issuer. Estimated Retail Value (“ERV”) of each Prize is between one hundred dollars ($100) and one thousand dollars ($1,000). ERV of Prize received will vary based on Prize awarded subject to Sponsors’ sole discretion. Prize will be announced on TODAY when the Winner is selected. Actual Retail Value (“ARV”) of Prize will vary depending on Prize selected by Sponsors. Any difference between ERV and ARV will not be awarded. If Prize includes a Trip, ARV may vary based on, among other things, availability, existing rates at time of booking, dates of travel, and point of departure. For any Prize with an ARV of six hundred dollars ($600) or greater, Sponsors will furnish an Internal Revenue Service Form 1099 to Winner for the ARV of Prize for the year in which Prize was won. If Winner chooses to travel or attend Event/Show (if applicable) with fewer than the number of Guest(s) (if applicable) allotted, the remaining elements of Prize shall constitute full satisfaction of Sponsors’ Prize obligation to Winner and no additional compensation will be awarded. Guest(s), if any, may be required to execute and return releases of liability and, except where prohibited, publicity releases (collectively, “Guest Documents”), which must be returned with the Sweepstakes Documents, or Guest portion of the Prize will be forfeited. If any Guest is a minor, Winner(s) must be such minor’s parent or legal guardian and must execute and return the Guest Documents on such minor’s behalf. Age restrictions may apply to Guest(s) depending on the Prize awarded.